I spent three years in the military, July 1963-August 1966, stationed in Germany. Returning home, I struggled with career possibilities. Learning those possibilities were limited in Southwest Georgia, I moved to Charleston, SC, where I had spent a few teenage summers. I applied and was employed by the Charleston County Police Department. A few months under three years later, March 1970, my search for a new career found a home with Pinkerton, Columbia, SC office, where I was employed as a private investigator. Seven months later, I was promoted to manager of the investigation department for the State of SC. Five months later, I was additionally charged with managing a portion of the uniformed security contracts. February 1973, I decided to leave Pinkerton, and start my own firm. 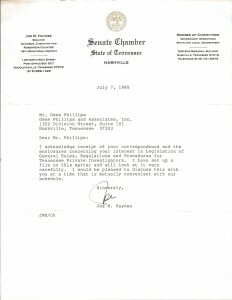 In August, 1987, which had been a two year transition plan, having National customers in Virginia, West Virginia, Kentucky, Tennessee, Alabama and Mississippi, I opened an office in Nashville. At that time the only licensing requirement to be a private investigator, in the State of Tennessee, was to be 18, pass a background check and pay an annual fee of $75. 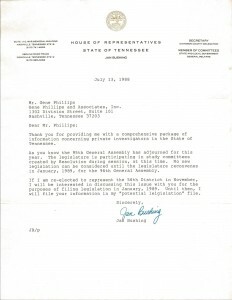 I quickly learned the reputation of a Tennessee private investigator was questionable! 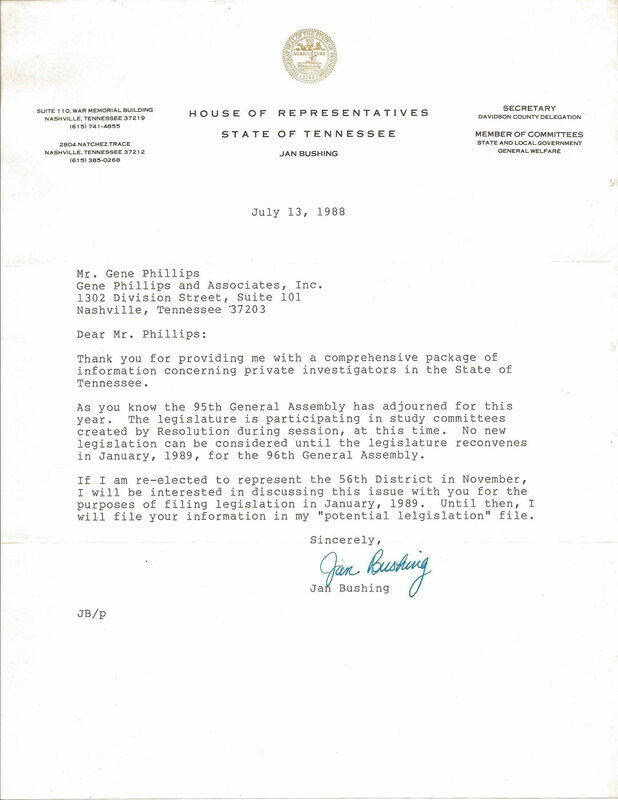 During 1988, I talked with members of the Tennessee House of Representatives, inquiring if they had any plans of passing legislation for private investigators. The response was they have discussed it, but as they don’t have a guideline, and will have to start from scratch, that more important legislation has taken priority. My response was, I’ll provide that foundation for you. At the time I had two secretaries, had them secure names and addresses for every Tennessee Legislator. I took the South Carolina Laws and Rules for Private Investigators, made notes of suggested changes, based on my 18 years experience, 1970-1988, and sent copies to each Tennessee Legislator. 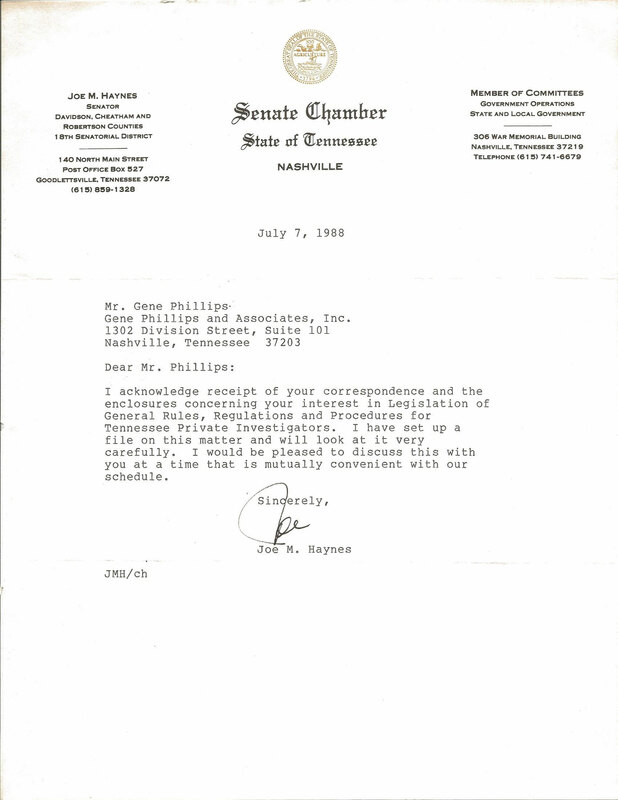 I received two responses of appreciation, and the law was passed, as submitted, with my suggestions unchanged, in 1990. There have been many changes since then, of which I have not contributed! As of this writing, July 2, 2012, Gene Phillips, Inc. continues with an untarnished record and reputation.